Widely acclaimed for its breadth and scope, The Cambridge Guide to Theatre Second Edition remains the most comprehensive single-volume guide to the history and current practice of worldwide theater available today. The Guide contains a wealth of information on all aspects of theater past and present: major playwrights, works, important traditions, theories, companies, practitioners, venues and events; the origins of popular theater tradition, including folk drama, street theater and mummers plays; the work of actors, directors and designers, including lighting and sound, technical theater, theater architecture and theater design. In this revision, all entries have been reviewed and updated to incorporate political changes and reflect the rise and fall of individual reputations. There are newly commissioned articles on Canada, Spain, New Zealand, Germany, the Caribbean and French-speaking Africa. Special attention has been paid to costumery and gay, lesbian, and feminist theater. A particularly strong feature of the new edition is the weight given to Asian theater and Asian influences on Western drama. 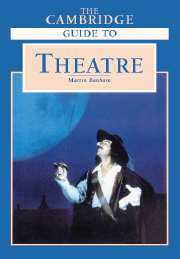 By providing information and entertainment, the Guide will prove an indispensable reference tool both for scholars of theater and general theater lovers alike.